I remember a certain Lent during my high school years where I stuck to my Lenten sacrifice like glue. I had given up gluten, for several reasons. For one thing, I really love bread, pasta, and baked goods, and knew this would be a tough sacrifice. My other motivation, however, was that my mom had celiac disease, and I wanted to have a greater understanding of her daily sacrifice. God helped me be really consistent that year, and I had a grace-filled Lent that prepared me to welcome Easter with more joy and anticipation than I had ever experienced before! Talk about a shot in the arm for my faith life. Fast-forward to this year, where I am a busy college senior trying to figure out, among many things, how I want to claim my faith life as my own once I leave this wonderful place. As I prayed about what I wanted to do for Lent this year, I kept feeling a pull to get to know Jesus in a more personal way; I craved to grow in deeper relationship with Him. Because of this, someone suggested to me that I engage in Lectio Divinia every day in Lent. Lectio Divina is a way to read Scripture that involves more meditation and trying to listen to what God wants to say to you through His Word. I made my checklist of which readings to do each day, and was ready to go! Well, unlike that year in high school, this Lent did not go so perfectly. I fell a little behind on my list of readings, and though I did feel like I was growing in my faith life, sometimes feelings of failure (which should not be what Lent is all about) started to creep in. As I sit here reflecting on the second half of Lent, however, I am realizing that during this time, God was just providing for me in an unexpected yet huge way. I fell behind on my agenda for Lent in part due to my pilgrimage to the Holy Land. As a campus ministry intern, this trip was my main focus all semester, and going on the pilgrimage itself was an incredible experience. Though the busyness of our days and my jet lag-induced tiredness at night hindered me from sticking to my mapped out reading plan, God was allowing his Word to come alive in my heart in a new way by allowing me to walk the paths of the Gospels. 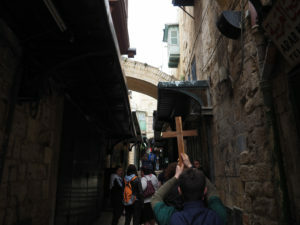 We had the chance to walk the Via Dolorosa, the way of the Cross. At the Church of St. Peter in Gallicantu on Mount Zion, we entered into the events of Holy Thursday by praying in the underground caves where Jesus was held and abused by Caiaphas and his guards. At Calvary, when I was too overwhelmed to know what to do or say, God gave me the time and space to sit and listen to Him. 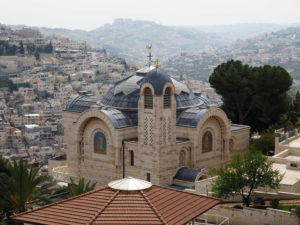 And now, each time I open my Bible or listen to the readings at Mass, my experience of Scripture has been transformed by the gift of my time in Israel. So whether you feel that your Lent was a rich time of spiritual growth, or if you fell off the bandwagon several times, do not worry. Jesus has risen from the dead, and never stops wanting you to grow closer to Him! I encourage you, much like you do in Lectio Divina, to just spend time with God and be open to whatever He has in store for you. God’s plan for my season of Lent this year was more incredible than anything I could have planned myself, and for that I am so grateful! As it is written in Constitution #119 of the Congregation of Holy Cross, “Resurrection for us is a daily event…We know that we walk by Easter’s first light, and it makes us long for its fullness.” I will be praying that you have a blessed Easter season and experience the joy of God’s daily Resurrection!